Theo’s grandfather’s death in a street accident is completely unexpected, and his last words to her are mysterious. “There’s …a letter…And a treasure,” he said. His words propel thirteen-year-old Theo into a mystery that shows there was more to her grandfather than she ever imagined. Theo finds an old painting in his studio, and she thinks she know who painted it. It’s bad news though, because Jack wasn’t anywhere rich enough to afford such an old painting. There’s worse news, too; Theo’s grandfather was a museum guard, and a painting has just been found missing from the vaults. In order to solve the mystery and save both her grandfather’s house and reputation, Theo must enlist her smarts, her resourcefulness, and an unlikely pack of new-found friends. Under the Egg is a cracking good mystery. The story engages the reader in its twists and turns. Even more engaging than the twists of the story is Under the Egg’s main character, Theo. She’s got a tough life that’s become much tougher with her grandfather’s death, but rather than feeling sorry for herself, she soldiers on and works to find a solution. And though Theo is the most fully drawn of the characters, all of the characters ring true. And they all have their surprising sides, some heartwarming and others sinister. Personally, I have always loved books that open up some part of the world to me. This book offered new insights into the world of art museums and auction houses. It also offered fascinating glimpses into certain aspects of World War II. I expect that Under the Egg may expose its readers to a new interest. Fitzgerald is ready to help with that, too. Her web page includes loads of information and source links to help interested readers delve further into the art and history referred to in the book. This is Laura Marx Fitzgerald’s debut novel for middle grade readers. I had to double check that because it’s so accomplished. According to her web page it’s true. 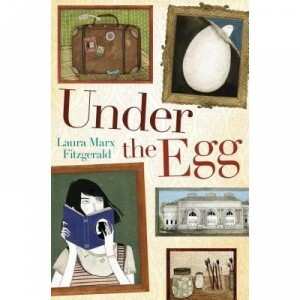 I’m so sorry that Under the Egg only came out this March because I’m already waiting impatiently for Fitzgerald’s next novel.